Happy (?) Groundhog's Day. Today started off with a bang for us. I woke to very soft music playing. Thinking it was my alarm clock I looked over to turn it off. It wasn't my clock and it was 7:30! My alarm usually goes off at 6:55 so I can get the girls up and ready for school. Yesterday my clock got unplugged and I later learned I had the alarm set for p.m. instead of a.m. Oops. So I don't know where the music was coming from. Maybe a guardian angel or something. I got up and woke up the girls. Couldn't believe they were still sleeping. Told them we overslept and they needed to move it. We were out the door 17 minutes later. Can you believe that?! Meg was about 10 minutes late but Mat was right on time. I wrote notes for both just in case. I was so glad Mat was buying so there was no lunch to pack only money to find. I wasn't really thinking about what I was going to shoot today but Mickey took care of it for me. I have been working on a 90" X 90" quilt for the last several days. An area leader of the woman's organization at church has asked us to make quilts to donate to the LDS humanitarian services. She has asked us (all the women in the area/stake) to make 100! Our congregation/ward is making 13. Oh, and she gave us two weeks to get them done. I really got into this challenge. I remembered that I had an unfinished project I could use to make a quilt. Years ago I was inspired by a quilt in a Target ad. I wanted to make the girls matching quilts. I bought all the fabrics and cut up all the squares. (I can't remember if I had my rotary cutter or not. If not that was a lot of cutting.) I had one twin one done except for the borders. I had also started sewing the other one. Since the girls would not like these quilts now I torn the borders off the first one and used pieces of the second to add to the first. Long story short I got the top done and had plenty of fabric for the back. I got it all sewn together (pillowcase method) today and I've been tying it since 3:00 with lots of interruptions. I think it's beautiful. It also has 500 squares. There's no way I would have taken on something like that if a lot of the work hadn't been done already. I hope my quilt provides comfort and warmth to whomever gets it. All day Kade has been giving me compliments about the quilt. He's also asked several times if I'm done yet because he thought it looked done. For the past few days he's been asking me if I can make him a quilt. The girls have chimed in that question too. I've told them not now. Those projects will have to wait until my life is a little less crazy, maybe during the summer when I'm not running them around everywhere. And do I really want to spend 100's of hours (and dollars) working on something they'll just stain or tear? I might have to wait until they are much older. The quilt is lovely. 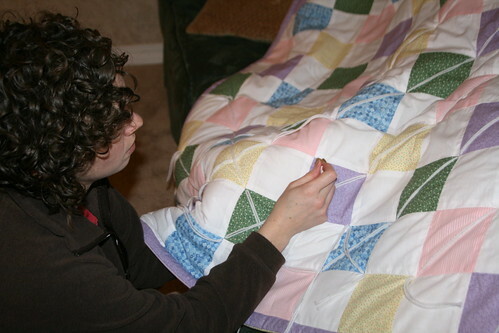 I know from doing quilts myself that they do take a lot of time. You are a very thoughtful person to give away such a beautiful thing! Good job! I have a quilt that I made for Mickey when he was little that has appliques of Star Wars and other things he was into, I'll have to show you sometime. He loved it! Maybe Kade would like to have it now, I don't think Mickey is that in to it anymore. Jessica, I totally agree on so many levels!